Barlow Books is proud to announce that Lesley Stowe has won a gold medal in an international competition for her luscious book, Desserts from My Kitchen. The competition, run by the Independent Publisher Book Awards, drew entries from Canada, the U.S., and around the world. Over 2,750 authors and publishers sent in 6,000 books for this 19th annual competition. Lesley’s cookbook tied for gold in the cooking category. It’s a tribute not only to Lesley but to the whole Barlow team who worked on this beautiful book. 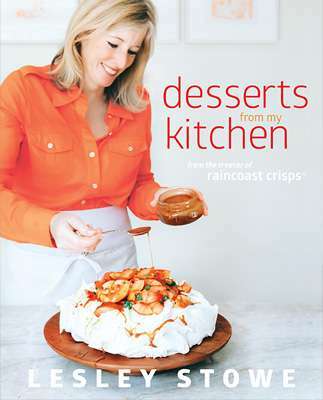 A great cookbook starts with the cook, and Lesley contributed the incredible dessert recipes that won her fame in Vancouver before she created the Raincoast Crisps. The famous crisps are now sold throughout North America and are one of Oprah’s favorite things. Cookbooks are beautiful design objects, and to make this a success we relied on a team from Canada and the U.S. In Toronto, editor Tracy Bordian took charge of the project. She managed the creation of the book, and all the details at every step. From Vancouver, designer Mauve Pagé translated Lesley’s vision into a stunning visual display, with spectacular spreads and clean, fresh recipe pages. Mauve designed two covers — one for the jacket and another one for the hardcover inside, as well as the delectable design of the endpapers inside the cover. Mauve had great pictures to work with, from Danielle Acken, a B.C. photographer who turned what Lesley imagined into gorgeous pictures of every recipe. The great Atlanta food stylist Tami Hardeman flew to Vancouver for the shoot to make the food and the photography look fantastic. Cookbooks belong in kitchens, on display, and there’s nothing like paper to make them look great. The Winnipeg printer Friesens did a beautiful job printing this book. It’s a pleasure to hold a book like this in your hands. Selling the book to stores across Canada is the job of our sales team at Manda, under the direction of Peter Hill-Field and Carey Low. They did an admirable job of getting the book to stores near you. In the U.S., New York-based Midpoint worked with Whole Foods to stock Desserts on their shelves. Lesley’s Raincoast Crisps are already selling at Whole Foods in the U.S., and the cookbook includes a couple of ways to turn crisps into desserts. Lesley Stowe took a chance to publish with a new kind of publisher, and this gold medal is the wonderful result.